Join these three feathered Superhero inspired vertebrates as they fight their monsters in Wild Worlds Video Slot. This slot works on a Cascading system where winning combinations of 3 or more matching symbols cascade and are replaced with new symbols. This feature then sets off a chain reaction that can result in repeated wins. Wild Worlds comes with features and a multi-level free spins bonus where you’ll fight monsters of all shapes and sizes. In the base game, the Destroy Feature may randomly activate following a no win spin. Symbols of one colour and any Scatter Symbol are left on the reels while the rest are removed. New symbols then cascade onto the reels increasing your chance of further winning combinations. Also during the base game, landing winning combinations comprised of medium win symbols/Hero symbols will transform all other symbols of the same type into wilds. This feature is known as the Hero Wilds feature. 1. Dark Forest – Spreading Wilds are placed randomly on the reels when the weak spot of a monster is destroyed. 2. Ice World – a stack of 2 Heavy Wild symbols is placed randomly on the reels when the weak spot of a monster is destroyed. 3. Fire Lands – between 2 and 4 random wild symbols are placed randomly on the reels when the weak spot of a monster is destroyed. 1. Captains when defeated will activate the wild feature pertaining to that level. 2. The Boss cannot be damaged unless all Captains have been defeated. If The Boss falls, the feature is re-triggered and the player is transferred to the next world. This Video Slot has been offered to you for Free by Slotsmillion – Enjoy and see what all they have to offer. 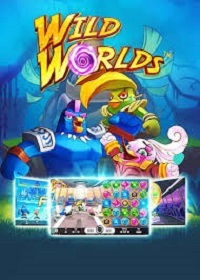 This entry was posted in Casino Games and tagged Play Wild Worlds Slot at Slotsmillion, Read our WIld Worlds Review on April 10, 2019 by Casino Admin.